This soapstone marker is used for temporary marking of metal surfaces during welding and fabrication. 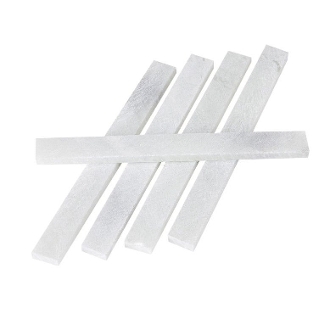 Made of all natural soapstone, the white texture is excellent for marking quality. Also great for temporary marking of textiles. Pack of 6. For the temporary marking of metal surfaces during welding and fabrication. Made of all natural soapstone for superior marking. Marks will not contaminate welds and are easily removed. Also great for temporary marking of textiles. 5" x 1/2" x 3/16" Flat marker.